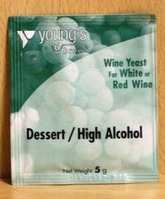 A high alcohol tolerant yeast which is suitable for making desert wines and mead. A high alcohol tolerant yeast which is suitable for making up to 5 gallons of desert wines and mead. To use, simply sprinkle onto the surface of the wine and wait for 15 minutes before stirring to disperse the yeast.